This post has been sent by Cornelia G. The following party was conducted with 20 players and 4 instructors. It lasts about three hours and easily fills an afternoon. It goes without saying, everyone coming to the carnival party, comes in disguise. This must be announced right beforehand. If the group does not meet on a regular basis, invitations with instructions for the carnival will do. It is important for the mood and other decorations. Paper garlands and lanterns are relatively inexpensive and can be reused for other occasions. Streamers, balloons and confetti are suitable too, while at the same time they are needed for some games. The association game is always very good as an introduction, as it offers a good blend of movement and thought processing. For this game you need three chairs at the end of the room. All players are on the other side of the room, with the team leader sitting in the middle chair. He also starts the game with the word: Carnival. Every player who knows a suitable word starts to run, trying to sit on one of the two remaining chairs. The one who remains without a chair, takes the middle chair and repeats his word. Everybody else can start running once again. It is needless to say, that at start-up the word “Carnival” has to be related to the other two associated terms. However, in each following round the terms can be used in a much wider sense, but none the less, must somehow be related to carnival. Important: no word must be repeated. 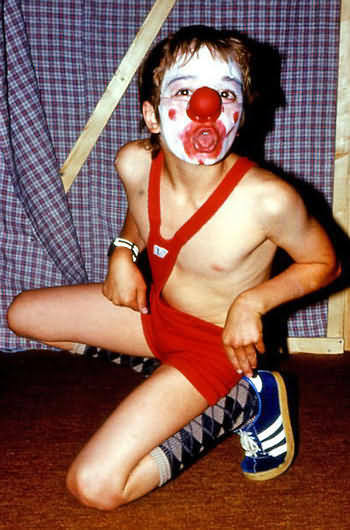 Children love to dress up and on a carnival the imagination knows no bounds. Therefore, the outfits are often very creative and unique. In a costume contest, children finally have the opportunity, depending on the nature of their costumes, to behave for once like a pirate, a cowboy or a princess. In this way, they are not only dressed up, but also get to play the character of their costume. This encourages their creativity and there's always plenty to laugh. Especially with the buzzing bees or the stomping Dinos. The jury consists of the game leaders. Each child has to present in front of this jury and present not just its costume but also make a movement or gesture according to the character they represent. At the end, the jury awards the best performance and dress. Depending on the group the jury can also select the best male/female, the best dress/performance or chose to award only one total winner. Decide before hand, whether there is a price, medal or certificate for the winner. For the Carnival Olympics all participants will be divided into equally strong teams. It increases the appeal of the Olympics that for every game won, points can be scored. The team with the most points wins. The air balloon race is kind of relay game. The teams split up into two groups. One half is on one side of the room, the other half is on the other side. Every team receives a balloon. Now the first player holds the balloon between his knees and tries as fast as possible to get to his team mates on the other side of the room and pass on the balloon. The group is split into two teams. Two players are always up against each other. They each receive a chocolate marshmallow (or anything else you choose) and eat this as fast as possible without using their hands. Winner is how has finished first. Please note: in a time and age of increasing childhood obesity eating contests are not the best games – particularly with sweets. A variation to this game could be, that the first person has to peel an orange as fast as possible and then give everybody one piece. I am sure there are not too many kids who actually would know how to peel an orange. Each team receives paper, scissors and glue. Now they have five to ten minutes to create a garland as long as possible. The team with the longest garland wins. Each player gets a plastic cup filled with confetti. Players have to balance this cup on their heads. The team player announces in which way the kids have to move. To make it easier, the players can have some time before the game actually starts, to practice, balancing the cup on their heads. "Touched your nose with your index finger." "Go to another player and shake his hand." Winner is, who does not drop his cup. Place a lot of sweets on the ground. Each kid receives a spoon and a bag/cup. Objective is to spoon as much as possible sweets into your bag/cup without using the free hand. Winner is who spooned the most sweets into his bag/cup. For the Carnival Quiz you need to prepare about 10 questions on the subject of Carnivals. You can ask for other names for the carnival, when the Carnival starts and ends, the meaning of the number 11 in regard to the Carnival and what sweets have to do with it all. Both teams line up. Then the first question is asked. The players may consult with each other but only the first kid in each team is allowed to signal (horn or bell) and give the answer. The team who gets the answer right scores a point. For every wrong answer there is a minus point and the next team has another go. If they are wrong as well, the answer goes back to the first team – and so on until the right answer is found. Then a new question is asked. Each team lines up in a row. On the other side of the room you have prepared different pieces of clothing, just as many as there are players in each team. The first player, runs over, grabs a one piece, for example a hat, puts it on, runs back, takes the hat off, gives it to the next player, who in turn now puts on the hat and runs for a second piece of clothing. He puts on the second piece and runs back to his team again. He gives both pieces of clothing to the next player ….. and so on. Winner is this team who’s totally dressed up player returns first. Divide the group into two teams. Two players always stand back to back, trying to inflate the balloon as big as possible without bursting it. As soon as one player stops, the other one has to stop as well. Winner is, whose balloon is bigger. Continue until every kid had a go. 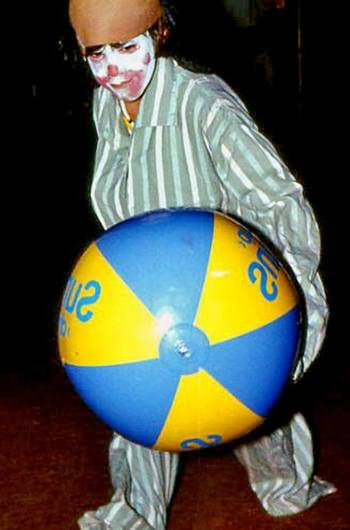 Every player has a go to perform the character of a certain carnival costume. For example: a clown, pirate, princess, etc. The team who guesses first, which character was displayed scores a point and the next kid gets a go in performing. With a cord or a rope the room is divided into 2 fields. Each court is filled with a number of balloons. The objective is, that each team tries to get as many as possible balloons into the opponent’s court. Winner is the team with the fewest balloons in their court. You need 2 teams. Two kids are placed, one at each side of a table. Two streamers are placed into the middle of the table. Both kids try to blow the streamer as far as possible into the other kid’s court. Winner is who gets the streamer the furthest on the other side of the table. Continue until each kid had a go. Each kid of each team receives a mandala and is given 5 minutes (or more). Winner is the team who was able to finish the most mandalas. An alternative could be, winner is who finishes the neatest mandalas. Winning is not all, it still has to be neat. Ropes are laid on the ground to create a little trail. The teams are each on the opposite side of the room, the beginning or respective end of the trail. The first player receives a small trump and a cotton ball. On command, both player start to blow the cotton ball along the trail by blowing in the trump. At the end of the trail, cotton ball and trump is passed on to the next player. This goes back and forth until each child had a go. Since extending the carnival party over an entire afternoon, it makes sense, to eat something together. At Carnival (in Europe) Donuts/ Kreppel/ Berliner are best suited for this occasion and therefore can’t be missed. However, you can also make a suitable decorated cake and offer several other snacks as well. (Mini-Berliner/ Party Sausages, little chocolate marshmallows, pretzel sticks, etc.). Whatever you chose, don’t forget to have enough drinks available. There are many well-known dance games around, which would fit the occasion perfectly well. Simply convert them into a Carnival theme and play the typical music as well. All kids dance around in the room, while a hat is passed around. The child who has the hat on his head tries to pass it on to somebody else’s head as fast as possible. The one who has the hat on his head by the time the music stops will be eliminated. If there are many children, this game can also be played with two or three hats passed around at the same time.